The dome colors are available in any combination. 16mm and 25mm Multiwall in clear or white and Cardinal Glass LoE366 & LoE340 coated insulated glass with many other coatings and tints are also available. 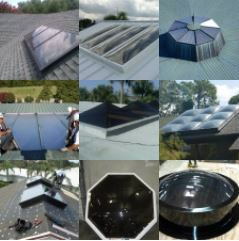 Unlimited glazing configurations exist so please consult with your local distributor or Maxim Skylights directly for custom glazing options. PALSUN Basic, UV, and Specialty Series flat sheet products offer a range of performance characteristics for a variety of applications. Basic Series products are suited for interior or short-term exterior applications, UV Series products offer guaranteed UV protection, and Specialty Series product offer a variety of surface coatings to achieve high-performance specifications. Unsurpassed by any clear glazing product on the market, MAKROLON polycarbonate sheet is hundreds of times stronger than plate glass and many times stronger than acrylic. This tough, long lasting material offers attractive protection in areas subject to high traffic, vandalism or burglary. It even withstands natural forces like severe wind, hail, and snow storms. In fact, MAKROLON polycarbonate sheet meets stringent state mandates for hurricane resistant glazing materials. Prolonged exposure to the sun can weather even the most durable of surfaces. In the past, acrylic was often chosen for plastic glazing applications because of its inherent resistance to yellowing over time. But compared to polycarbonate, the relative brittleness of acrylic made its impact strength insufficient for demanding, vandal resistant applications. To meet this need, Sheffield Plastics developed MAKROLON SL polycarbonate sheet. It offers the best of both worlds–the impact protection of MAKROLON polycarbonate sheet and the UV resistance of acrylic. Utilizing advanced formulations combined with state-of-the-art extrusion technology, Sheffield Plastics has created a tough, consistent quality product that will exhibit superior performance for years to come. The performance of MAKROLON SL polycarbonate sheet has been well documented through years of laboratory and field testing. In side-by-side comparative testing under severe conditions, MAKROLON SL polycarbonate sheet consistently outperformed competitive materials utilizing older technology. Materials were also tested in forms and bends well beyond recommended guidelines, proving that the integrity of SL, as well as its UV resistance, will not change if the sheet is bent or cold-formed. So conclusive was this testing that Sheffield offers a limited warranty against excessive yellowing, loss of light transmission, and breakage. Makrolon® UV polycarbonate sheet is an enhanced UV-resistant sheet with exceptional weatherability and high impact strength. Available in clear as well as a variety of colors, UV is the perfect choice for architectural applications where extended service life and resistance to color shift is required. Makrolon® UV polycarbonate sheet is easily thermoformed, fabricated, and decorated. This performance is backed by a 10-year limited warranty against breakage, excessive yellowing, and loss of light transmission. DURAPLEX continuously-processed, impact-modified acrylic sheet is up to 30 times stronger than double-strength window glass and 50 times stronger than polished wire glass or other glasses, making it an excellent choice for displays, skylights, signage and replacement windows. ⦁ 100% impact modified acrylic is 10 times stronger than general purpose acrylic, approximately 20 to 30 times stronger than double strength window glass, approximately 40 to 50 times stronger than polished wire glass or other glasses.